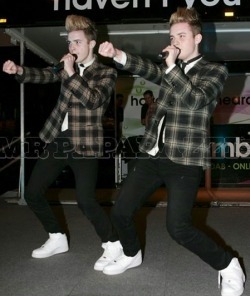 Watch out New York Jedward are Coming!!! Following their recent, and generally well-received, performance at the National Television Award’s on Wednesday night, John and Edward flew back to Ireland, to help launch Eircom’s online education StudyHub at Mansion House in Dublin.The X Factor twins jumped around in front of the cameras, posed for pictures with Xpose presenter Lisa Cannon and performed their debut single ‘Ice Ice Baby,’ which is going to be made available for download on 31st January. As the boys unprecedented level of popularity continues to grow, theyare off to New York in a few days time to record their first official music video with Vanilla Ice. However, one person who isn’t a fan of the terrible twosome is none other than One Show host Christine Bleakley, who reportedly told the pair, “You paint a bad picture of Ireland” just before they were due on stage on at Wednesday nights award show. Well that wasn’t very nice of her was is it?! So it's interesting to hear that viewers could have been seeing a lot more of them - if it wasn't for Simon Cowell. It turns out the boys had been lined up as contestants on C4's Celebrity Big Brother and everyone thought it was a great idea, including their mentor Louis Walsh. But at the last moment, Simon pulled the plug. "We were going to have them in the house for the first week, because they had other commitments," my spy moans. "The boys were keen and so was Louis, but Cowell put his foot down. "He may have berated them for weeks on The X Factor but when it came to them appearing on C4, he said: 'They belong to us'." Shame, it would have been nice (nice, baby). 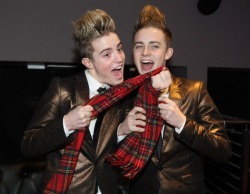 X FACTOR stars Jedward, 18, caused chaos yesterday as were guests on Little Brother. They were allowed to spy on the celebs from behind the mirrors. But they were so loud, the stars heard them and rushed to get a look. Last night X Factor megastars John and Edward performed at the Empire nightclub in Middlesbrough and for some unknown reason the crowd went absolutely ballistic.Even the twins said it was “one of the loudest” gigs they’ve ever had as hundreds turned out to watch them perform Rock DJ, Under Pressure, I’m Your Man, Ghostbusters and Oops I Did It Again. Wait a minute, no Ice Ice Baby? What’s that about?! Anyway, after the gig (can we call it a gig?) Jedward hung around for an hour chatting to fans and signing autographs. John and Edward Grimes, 18, impressed the US star so much with their cover of Ice Ice Baby rap during an X Factor live show that he contacted them about teaming up. A source told The Sun: "Ice couldn't wait to work with the boys after seeing their performance." "He thought it was genius and now sees the chance to bring his record to a much younger audience." "The boys even look like he did back in the early days." Jedward’s manager and X Factor mentor Louis Walsh said: "They are beyond excited about working with Vanilla Ice - I've never seen them so excited." DIG out your earplugs - Jedward are back.The tone-deaf X Factor twins, 18, are the star act at next week's National TV Awards. Insiders claim the pair have a new routine to, er, impress us with. Rumours suggest that they may perform a medley of their X Factor "hits", including Ghostbusters, We Will Rock You, Under Pressure and Oops, I Did It Again. A show source said: "We're billing this as the main event at the NTAs as we know how everyone loves the Jeds." Chiefs will deck the O2 arena, East London, with thousands of crystals. Jedward have spoken out about X Factor and Girls Aloud singer Cheryl Cole, by saying that she will reach the same success as Justin Timberlake did when he left his old band N Sync. The twins have recently claimed that they wont disappear from the spotlight, and have reportedly landed a record deal and an ITV2 documentary is also in the works. Cole, on the other hand has previously descibed Justin Timberlake as a d***head, and has no interest in meeting the ‘Rock Your Body’ star who is also currently filming a ‘Facebook’ movie. I don't know what these girls are thinking but this is an article from todays Daily Star. 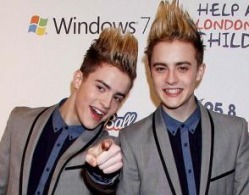 There's only one Jedward though!!! 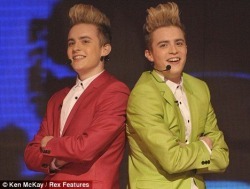 MOVE over Jedward, twin sisters are about to steal the boys’ thunder. Alana and Natasha Horn, 19, are the talk of TV after appearing on the new dating show Take Me Out. 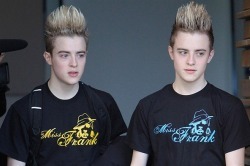 They have even given themselves a Jedward style nickname – Alanatasha. Student Alana giggled: “Our mum and dad think we can sing. So maybe we should try X Factor and see what Simon Cowell thinks. The dippy duo of Accrington, Lancs, are among 30 girls looking for Mr Right. Alana has revealed being a twin has its advantages when it comes to dating. JEDWARD’S eagerly anticipated appearance in Birmingham is now just days away. The popular Irish duo, famed for their unusual cover versions on last year’s X Factor, were due to perform at the Nightingale Club, in Kent Street, shortly after their exit from the smash hit ITV show last December. 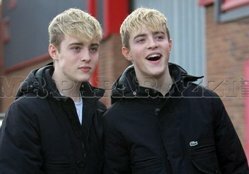 But the famous twins, real names John and Edward Grimes, pulled out of the gig with their management citing exhaustion. Now the Dublin duo, rumoured to be teaming up with former mentor and pop guru Louis Walsh to release a single later this year, are finally set to take the stage on Saturday. X FACTOR runner-up Olly Murs has revealed he hopes to follow in the footsteps of teen sensations Jedward -- by getting his mentor on the show, Simon Cowell, to be his manager. The Essex singer claims that having their mentor, Louis Walsh, on board will ensure the Grimes twins remain in the limelight for years to come. Olly is now hoping that Cowell will be willing to take him under his wing when he returns from his annual Christmas break to Barbados, thus ensuring he doesn't go down the same path as some X Factor finalists from previous years and disappear from the limelight. "It's good for Jedward definitely," he told the Herald. "I mean look what he's done for Westlife and Boyzone's careers, he will definitely keep their name out there. "They needed someone to guide them and Louis is definitely the right guy for them. You just don't know how long anyone's going to last, but I think they have a good shot now. "Simon's in Barbados at the moment, I haven't spoken to him, it would be too expensive to call him there. I'd love to talk to him and see if he has any plans for me or not, though. Of course I'd love to work with him again, but either way I'm just grateful to be doing what I'm doing and making the most of it." Olly, who lost out in the X Factor final to Cheryl Cole's protege Joe McElderry, went on to explain how he had not managed to stay in touch with 18-year-old twins John and Edward Grimes since leaving the show, as he doesn't have their number. The rising star claims that the boys' fame has grown so much, that even he and the other contestants find it difficult to contact them without going through their agent. Olly claims he's most looking forward to reuniting with Jedward when the group take off on the annual X Factor tour later this year and would have been devastated had they pulled out in order to take part in Celebrity Big Brother. According to the popular star: "If they weren't on the tour I'd be gutted. Everyone loves the boys and they just always make you laugh so much. They're just so fun and so full of life. I'm so glad they're getting the respect they deserve now. "Not one person could say they had worse press or a tougher time than Jedward on the show but at the end of the day they handled it well and didn't fall apart and I think they'll be stronger people because of it." Olly who jetted into town yesterday to officially launch Vodafone's new campaign, Cheer Up Your Top Up, which allows pre-pay customers up to 40pc off top-ups through January, at the Westbury Hotel, says he can't wait to return to Dublin in March with his X Factor pals. The 25-year-old heart-throb claims that he and close pal Afro-Jamie, along with his once rumoured love, Stacey Soloman will be hitting some of the city's top celebrity nightspots during their stay. US pop newcomer Sky Ferreira has offered to write a song for John and Edward. The 17-year-old singer, who has co-written her upcoming album with hitmakers including Bloodshy & Avant (Britney Spears), Linda Perry (Pink) and Greg Kurstin (Lily Allen), became a fan of the twins while staying in the UK last year. "Oh my God, I love Jedward! I was in London quite a lot over the fall and I would always watch X Factor when I couldn't sleep," Ferreira told DS. "Other people found them offensive, but I just found them amusing. They did great to get as far as they did." When asked whether she would be interested in writing for the duo - who recently said that they wanted to launch their recording career with 'something completely outside of the box' - she replied: "Of course! I would write them a song any minute! 'Ghostbusters' was amaaazing..."
Ferreira, who has been working on her own album for more than two years, also revealed that pop fans can expect to hear new material within the next few months. "I'd say Springtime - maybe March? I haven't put anything from the album online yet because I don't want to set myself up without finishing it properly,"she said. "I want to be completely ready when I come out. I didn't work this long to be mediocre." They may have cancelled two gigs after being pelted with bottles during a gig earlier this month, but X Factor act Jedward keep turning up like a bad penny. Irish stars, John and Edward, surprised a pantomime audience when they made a guest appearance at a production of Robin Hood at the Olympia Theatre in Dublin. And they seemed to have toned down their high-rise hairstyles a little, with a more refined, slicked-back look - though of course they kept their trademark high-top style trainers to match their black suits, white shirts and black ties. The Grimes brothers' surprise arrival delighted the audience, a large portion of which was made up of young children. The pair have had their fair share of ups and downs since leaving the talent show. However, they were soon back to doing what they do best with a barn-storming performance at Capital Radio's Jingle Bell Ball at the O2 arena in London a few days after the incident. Just two weeks later they were left red-faced after they had to call off their attempt at the world's loudest scream at a gig after too few fans turned up. However, after singing some traditional Christmas anthems, the pair were told there was no chance of smashing the current record of 129 decibels - the equivalent of a jumbo jet engine - because there were not enough people at the event. Meanwhile, Baywatch star David Hasselhoff said he wants the Irish duo to sing the theme tune in a movie remake of the lifeguard show. And he predicted the twosome would go down well with the U.S. public, saying: 'We love acts like this. They'll be stars, I'm sure, whether in music, TV, movies or all three. Lord Of The Rings director Peter Jackson is also said to have invited them to audition for roles in his forthcoming films. BAYWATCH actor DAVID HASSELHOFF wants X Factor's JOHN and EDWARD GRIMES to star in a movie of his TV lifeguard show.And the America's Got Talent judge thinks the 18-year-olds, dubbedJEDWARD, should sing the theme tune. David Hasselhoff ... 'they would be hilarious'David, 57 - nicknamed The Hoff - said: "I loved Jedward. I'd definitely give them a starring role. "Can you imagine them running around the beach and saving people in the sea? They'd be hilarious. "Hair and make-up staff would have to make sure their quiffs stayed in place!" Baywatch ran for 11 series from 1989 to 2000 and madePAMELA ANDERSON a huge star. David - also a successful recording artist - said the twins could sing the movie version's theme song with him. He said: "It would be so much fun. Jedward and The Hoff teaming up, could it get any better? I bet we could get a No1." US talent show judge David predicted that the American public would fall for the twins. He said: "We love acts like this. They'll be stars I'm sure, whether in music, TV, movies - or all three. "You want to find theSUSAN BOYLEwho's going to be a superstar, but you also want to find acts that are a lot of fun and make you laugh. "I've a feeling Jedward are going to be well known in the next year. 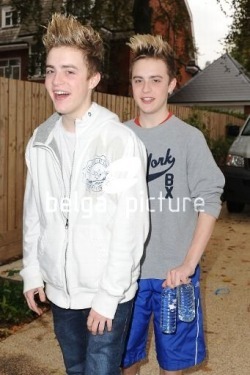 John and Edward Grimes, the Irish teenagers who became an unlikely sensation on the ITV talent show, have been invited to do a screen test for the movie, scheduled for release in 2011. A report in The Sun says staff working for film producer Peter Jackson contacted the twins’ manager Louis Walsh with the invitation. If the 18-year-olds are successful, they will be flown to Los Angeles to meet Jackson and film director Guillermo del Toro. They could be offered the roles of twins Fili and Kili – part of a band of dwarves who accompany wizard Gandalf and hobbit Bilbo Baggins on a mission to reclaim treasure from a dragon. A film insider told the newspaper: "Peter is keen to see if Jedward have any acting ability. He needs twins for these parts and they have a perfect look for the film. "But the characters have very prominent roles. They are the youngest dwarves and are sent out scouting a lot. 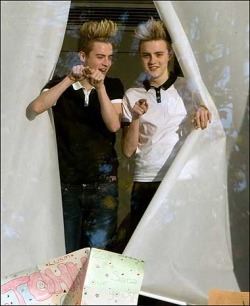 "The big question is whether Jedward could settle down on a major shoot because they are so excitable and hyperactive." The Hobbit, based on the JRR Tolkein book, is due to be released in 2011 and filming will begin in the summer. Among others rumoured to taking part is singer Tom Waits, whose voice could be used for the part of Smaug, the dragon faced by Bilbo Baggins at the climax of the tale. Other potential roles for Waits include Beorn, a dwarf who turns into a bear or Thorin Oakenshield, the dwarf leader.